Green Tea handmade, artisan soap is a unique and amazingly true green tea scent that will clean gently and thoroughly without stripping the skin. Buy one for a birthday or a unique Christmas gift. 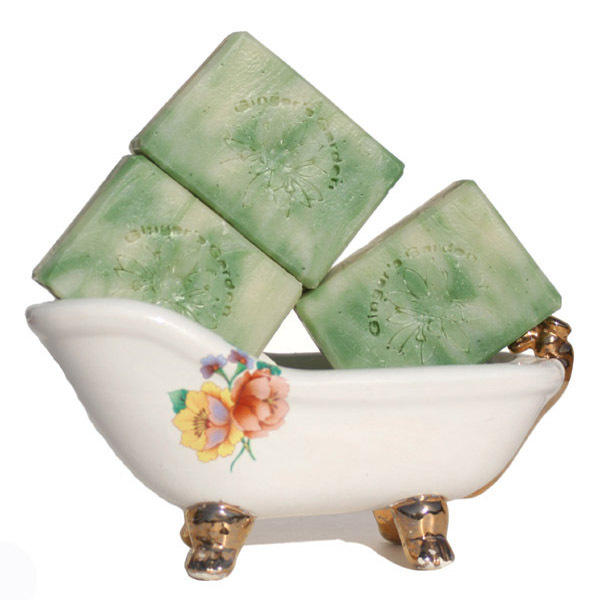 Green Tea Artisan Soap is a true green tea scent with no citrus notes, just like freshly brewed Japanese green tea. This soap is safe to use as a facial bar. My cold process handcrafted soaps are made with pure vegetable base oils like olive, coconut, palm kernel and castor, and created with the old fashioned European soapmaking method that has been passed down through generations. It’s now available from Palm Springs, California! Mild fragrance and creamy bubbles in this soap make it an ideal soap for everyone. Very Zen soap, clean, and fresh! All my handmade soaps retain the natural goodness of glycerin which occurs when the soap batch is first made. Try this soap with gently uplifting and refreshing fragrance that brightens the mood. Soothe your mind and help relieve daily stress. If you enjoy clean, spa-like scents, buy Green Tea Handmade soap for its unique and amazingly true green tea scent. Each soap is hand cut and creates lots of creamy bubbles in your shower. Or relax with a bar in your favorite bath. Please allow for small, natural variations in color, size and weight. After all, this soap is made from scratch by hand and cured for over 6 weeks. Ingr: Green Tea, Olive oil, Coconut, Palm Kernel, Mango Butter, Castor oil, Soybean, Sodium Hydroxide, Beeswax, Fragrance, Sodium Lactate, Green Oxide.